With Labor Day Weekend kicking off in just a few days, airports across the country will be flooded with people on what is one of the busier travel times of the year. For travelers headed to and from the Philadelphia area, the outlook for flight delays and cancellations ... isn't great. 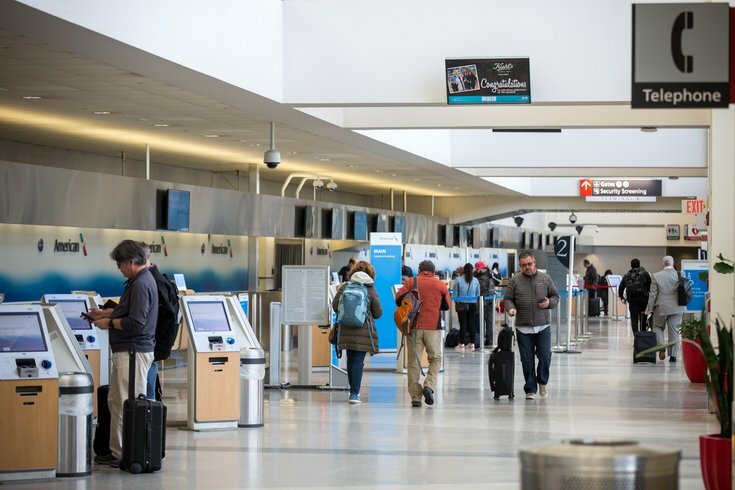 The folks at RewardExpert quantified the holiday travel experience, using five years of flight data from the Department of Transportation to rank 45 international airports in the U.S., helping to determine which travelers can expect the most delays. Philadelphia International Airport ranked toward the end of the list, with among the most delays, at No. 37, down one spot from RewardExpert's report last year. The data shows that 82.7 percent of flights out of PHL during the holiday weekend run on time, though that rate has worsened over the last few years. Another airport commonly used by Philadelphians, Newark Liberty International, is even worse. Nearly ranking dead last at No. 43, Newark had a reported 76.6 percent of flights on-time during Labor Day travel. The airport has an average 2,407 total flights during the holiday weekend travel period, compared to PHL's average 1,660. Besides Newark, the worst airports for on-time performance during Labor Day weekend include New York's LaGuardia Airport, San Francisco International, Louis Armstrong New Orleans International, and Boston Logan International. When it comes to airports in other major cities, Minneapolis/St. Paul, Dallas/Fort Worth, Seattle-Tacoma, and Atlanta all have much higher ratings than all airports in the Mid-Atlantic and Northeast region. Honolulu, Hawaii, ranked No. 1 with a 90.9 percent of its 1,100 average Labor Day flights running on time. In line with Honolulu's high on-time ranking, Hawaiian Airlines was also ranked the most on-time airline. Frontier Airlines ranked No. 4, with 85.65 percent of flights running on-time; American Airlines ranked No. 5 with 84.61 percent. RewardExpert's 2018 Labor Day Air Travel Forecast also estimated the best and worst days for travel; unsurprisingly, Friday and Tuesday will be the most congested times at the airport, whereas traveling during the actual weekend – Saturday and Sunday – will give travelers the most breathing room. Traveling the Wednesday before Labor Day, the Monday after, and the following Wednesday are also options with less delays and cancellations. Check out the full travel forecast here. Staying in town instead this weekend? Be sure to check out our guide to Labor Day festivities in Philly.